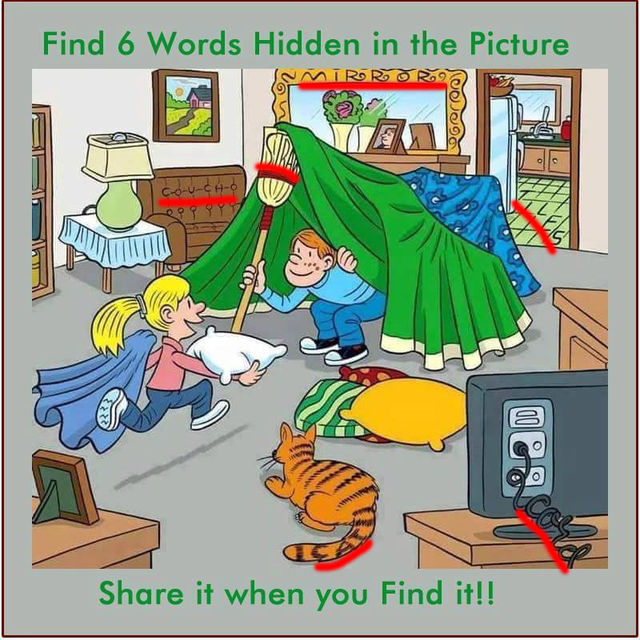 So Far No One We Asked Could Find All 6 Hidden Words In This Image – Do You Think You Can? Puzzles and optical illusions have long been a popular pastime for people across America. Not only is it fun to take a look at they can also reportedly improve your cognitive abilities. And with the risk of Alzheimer’s for thousands of Americans, this is a great alternative. In the image below, you’ll see a cartoon drawing of two children playing in their family living room. The boy is building what appears to be a fort while his sister is running to join him. The family cat watches contentedly from the side as the kids joyfully play. In the image, six words are hidden in plain sight. Are you able to find them all? Want more tips to make you smarter? Here you go! While games and puzzles are a great way to keep your brain engaged on a productive activity, they are not the only way to keep your mind sharp as you get older. According to cognitive neuroscientist Sandra Bond Chapman Ph.D. in her blog on Psychology Today, you can improve your brain health with a few other simple tricks. First, stop multitasking. Research proves that your brain can only do one thing at a time. When you shift between tasks you’re weakening your brain power. Your mind needs to adapt to the new task before it can efficiently complete it. Multitasking, distractions, and notifications, make it harder for our brains to do their job. Multitasking “actually overloads and fatigues the brain, making it less efficient,” Dr. Chapman said. Dr. Chapman also went on to suggest that cutting ties from technology altogether goes a long way in improving your cognitive abilities. Even if you just turn off your phone or tablet for 30 minutes, you can reap the benefits. Quiet can really help your brain get deeper into a task. Keeping your brain sharp is important for you. Nothing is more demoralizing than the thought of losing your mental sharpness as you age. While puzzles can help a little bit, try to eliminate multitasking, disconnect from technology every day, and think deeper for optimal brain health.